Remote Desktop Service will stop working in 104 days. Obviously, RDS Host is running in the licensing grace period (I have already described a similar problem, but the situation is a bit different here). As you can see, there are no licenses available to clients, since the licensing mode is not set. 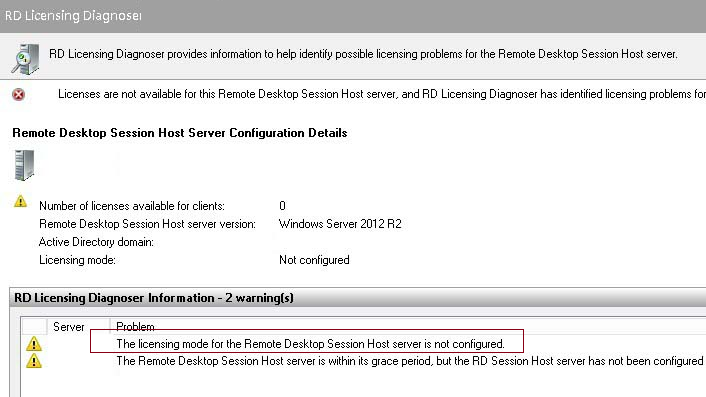 It means that the administrator has not selected the RDS Licensing Server and/or the licensing mode. It should be done even if the licensing type has already been specified when deploying the RDS host. Note. Get-RDLicenseConfiguration cmdlet may return different, erroneous data. There are several methods to force set the RDS licensing mode. 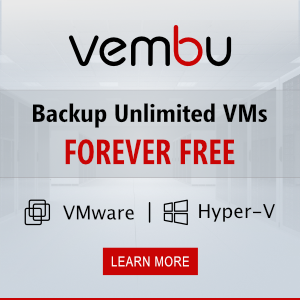 4 – if Per User licensing is used. After you have made the changes, restart your RDSH server. 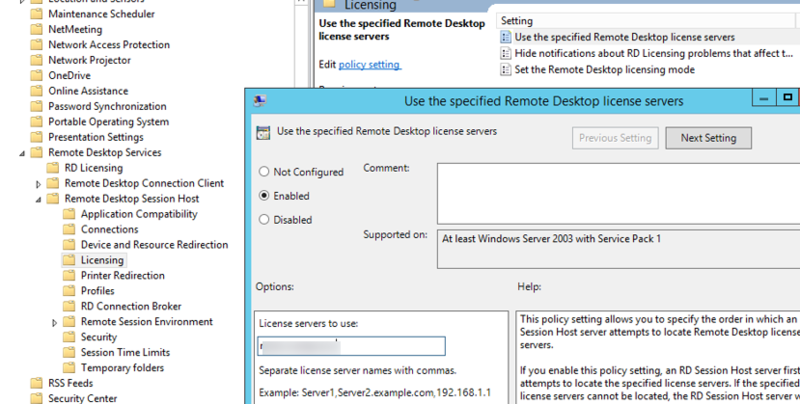 You can also configure the RDS license server parameters using GPO (a local or a domain policy). Suppose, the server is not in the domain. Let’s use the local editor gpedit.msc. Go to Computer Configuration -> Administrative Templates -> Windows Components -> Remote Desktop Services -> Remote Desktop Session Host -> Licensing. 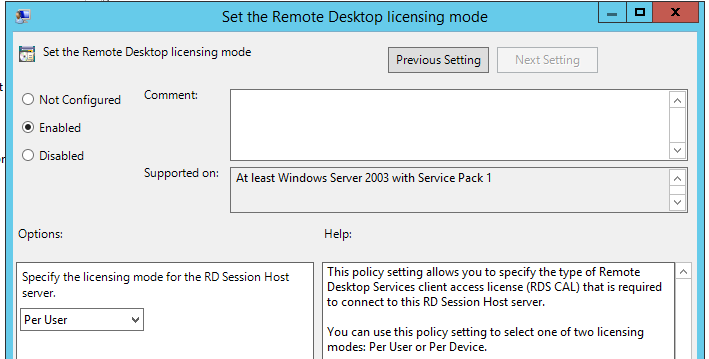 Set the Remote Desktop licensing mode – select the licensing mode. In our case, it is Per User. After restarting your server, open the RD Licensing Diagnoser and check the number of available licenses and the licensing mode you have selected. Note. If your RDS server is in a workgroup, the licensing report is not generated, although the terminal licenses themselves are issued to clients / devices correctly. You will have to monitor the number of the RDS CAL left yourself.